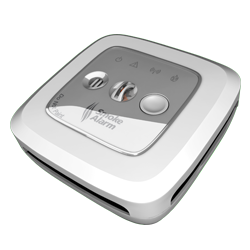 Our Combination Smoke Alarm is the “Smartphone” of smoke detection. Patent pending, it’s twist-lock smoke chamber, intelligent microprocessor that constantly runs self diagnostics every 4 seconds, and dual supplement temperature sensors… our Combination Smoke Alarm provides safety and peace of mind for your family. This is why our alarm uses tomorrow’s technology for today’s home. We believe we built the best smoke alarm available — one that goes against the conventional thinking in an industry driven by low cost. When it comes to the lives of the families we protect, we are the Rolls Royce of smoke alarms.